Right, from the start of this review can I get the cover out of the way. As a teenager I was an employee of both a bike shop and a book shop. Separate entities, but what they had in common was the fact that they both sold second-hand items. Old books and bikes, how they look, feel, indeed how they make me feel is important to me. Remembering all my old cycling posters gives me a certain tingle, something I also experience when I examine the dust jacket of an old book. 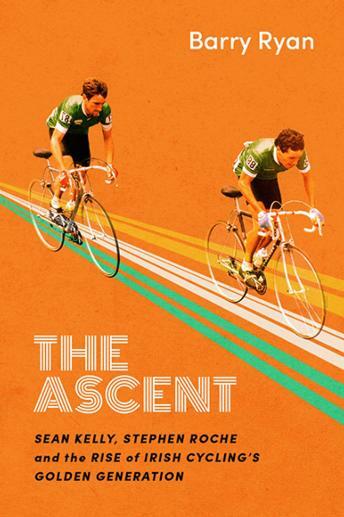 The front cover of Barry Ryan’s book ‘The Ascent’ has an interesting image of Stephen Roche and Sean Kelly. The event was the 1983 Goodison World Championship Road Race. The photograph is interesting in a number of ways. Both are wearing green Irish national jerseys. Roche, number 88, is in the lead. Sheltering behind him is Kelly, no 87. As an OldVelo I am interested in the bikes as well as the riders. What I am looking at ends up being the perfect illustration, or illusion, of what the book uncovers. Despite being from Ireland, at the time a veritable cycling backwater, both are using aluminium frames – well ahead of their time. On closer scrutiny this photograph becomes really fascinating. I regard myself as being reasonably well informed about the various trends and gimmicks that have come and gone over the years, this one really threw me. Their chainsets and derailleurs are on the left hand side – either I was spending too much time in the aforementioned bookshop in the eighties or there’s something wrong here. Roche’s frame decal reads “toegueP”, a new one on me – one step forward one step back. Kelly’s race number has been corrected to look right for the onlooker – the image must be maintained. Photoshop has a lot to answer for but the results still stand! That is exactly why every cycling teenager of the 80’s should read this book, because it’ll leave you with a question the cover image excites, did Roche really lead Kelly or Kelly Roche and, frankly, and you know this, everything is not as it seems. The book is a great read, affirms and reminds us of many of the famous incidents, good and bad of the ‘Golden Generation’ of Irish Cycling. The author, obviously, has a good reputation with the riders. He got them to speak with candour about some, but not all, of their experiences. He doesn’t rely on their autobiographies for the facts, preferring indeed to remind readers of what our heroes omitted as much as included. He deals candidly with sensitive issues such as: drugs, difficulties, weight issues and the insider ‘wheeling and dealing’ that was so much a part of pro careers. The puzzles and jumbles of the period are laid bare, and cleverly by letting the riders to voice their own scripts, it leaves the readers to draw their own conclusions. We should recognise that the author addresses an oversight that often occurs when the history of Irish Cycling is being discussed. His account is fascinating. The oversight is not the career of Elliott, it’s not Crinnion, it’s not Kimmage nor Earley. 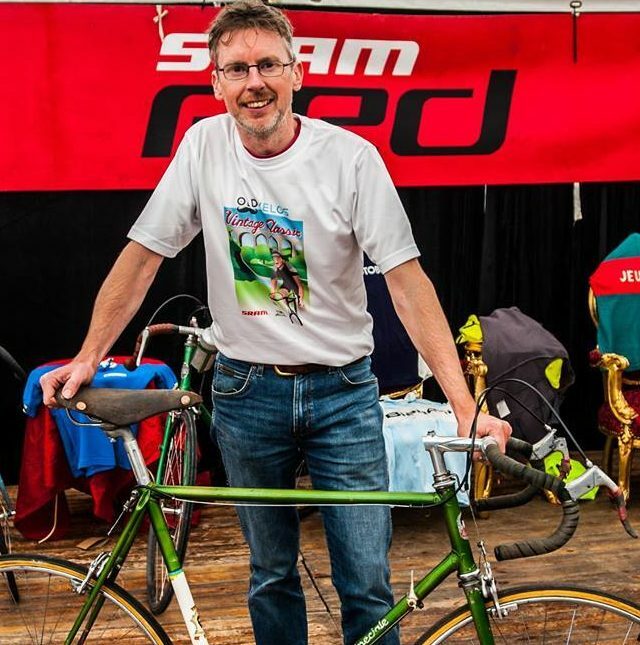 The person who rarely gets included in the ‘who’s who’ of Irish Cycling is, of course, Alan McCormick. 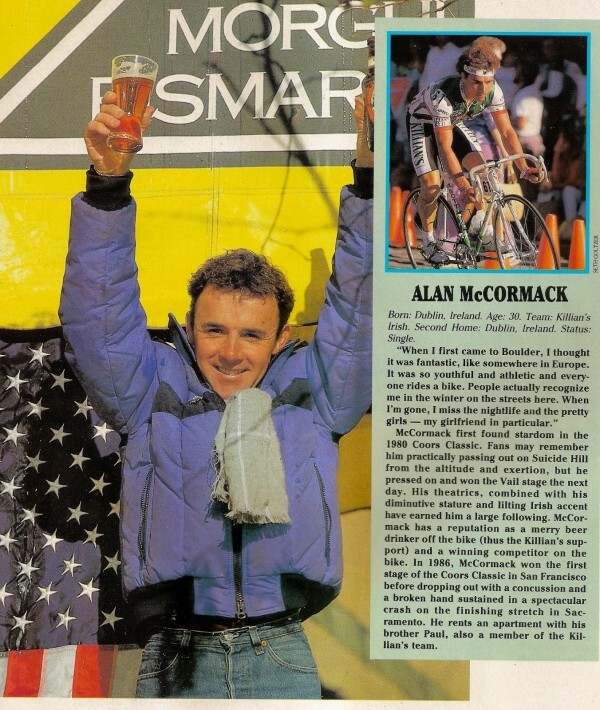 Thirty years ago we finally had our own ‘World Road Race Champion’ and sadly it was possibly the last time that Alan McCormick raced in Europe. I’m open to correction on that, but at least Ryan corrects the record by bringing McCormick’s role and reputation to the fore through his account of Villach, Austria ’87. Two years later, I remember shouting at the TV, jumping up and down and being so proud of Martin Earley as he soloed from his three breakaway partners to win a Tour de France stage. No mean feat and his second grand tour stage. God, what I would give to have won a stage of the Tour de France, and yet Martin doesn’t seem to give it a second thought. Ever self-effacing he said: “I knew that would be pretty much as good as it would get”. Earley, obviously a respected professional, gave just enough to stay away from the pursuing peleton and seems to have maintained that momentum when it comes to being interviewed for this book. Unlike Paul Kimmage of course. Poor Paul. If the publishers ever decide to reissue the book with a corrected front cover they might also consider a ‘parental advisory’ notice. If there was a bonus paid for the amount of expletives used Kimmage’s contribution would certainly have earned the author a holiday in the South of France. Former Taoiseach Brian Cowen famously said ‘anger is not a policy’. No one thanked Brian. Pat McQuaid feels he suffered the same fate, though his role, he would have us believe, was misunderstood all along too. This is covered too. We can thank Barry Ryan though for bringing us back to the 80’s. I still have plenty of old books from down the years that give glory to the glories of what were my heroes. I cherish those books and when I revisit them I still get ‘goose bumps’, they were great times. Soon after the end of the 80’s I gave up cycling, took down my cycling posters and took up other pursuits. The taste of my first beer was bitter, but I got used to it. Ryan reminds us of those years and challenges the perception that the acquired taste was all smooth as, sadly, there remains lot of bitterness too. He’s called this fine book about Messrs Kelly and Roche in the 1980’s The Ascent. Presumably because ‘The Descent’ had already been taken. 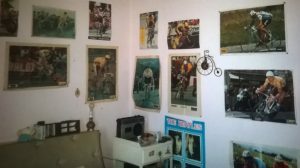 Next story L’Eroica 2017 – a brief review…..